1. I recently got married and I have been struggling major with post-wedding blues. The day was perfect in every way possible, but I am having a hard time with the fact that it’s over! Did you ladies deal with this at all? If so, what are some remedies?! Meggan: I definitely had them a little! We were in Cabo and St. Lucia for two weeks so when it ended it was like what now!? It was all that planning and build-up and then it was just over. Some ideas to ease the pain (lol): make a wedding album on Shutterfly, plan date nights so you have something to look forward to, or help a friend plan her wedding! 2. Jean short recommendations? I love One Teaspoon but always have a hard time deciding which pair to get since there are so many options. Was browsing ShopBop and looking at variations of the Bandit shorts since I already have two pairs…any suggestions? I was eyeing this pair. Love those! Also love this pair and this pair! This pair is our all-time favorite! 3. You’ve talked about your anxiety – have you ever found any self-help books that you’ve enjoyed? Meggan: No I haven’t but would love any recommendations! Brooke: I have not read any, but I need to! This one sounds really good and has great reviews, just added to my cart. 4. Meggan – just wondering if you told anybody about the ceremony that you had before your actual wedding? We did the same thing and only a few close people know about it. I just feel like I’m being judged by some people because of it even though we had our reasons for doing it. Did you encounter any of this? How did you handle the situation? We told our close friends and immediate family! I don’t think anyone questioned it since they knew our reasons for doing it. We don’t consider that ceremony our actual wedding date (I honestly can’t even remember what it is lol) and don’t plan on celebrating it. It was easier to get married in the states before going to Mexico + it worked out with moving (I didn’t want to have to get a new license two times in a couple months), insurance with Cam, taxes, and all that fun stuff. I think it’s silly of people to judge, especially if you have your reasons for doing it. I would just ignore them! 5. I bought these shoes because they remind me of the dress Julia Roberts wore in Pretty Woman. But now I can’t figure out what to wear them with. Any ideas? Love a good jumpsuit! Some cute ones are here (so good! ), here, here, and here! 7. Meggan – what hair products do you use on your hair? My hair is blonde and I’m ready to try something new to keep it fresh and healthy. I use this purple shampoo 1-2 times a week, this color boosting deep conditioner (I use it whenever my hair is looking dull), this platinum blow-dry spray, this heat protectant, and this oil as a finishing product. I rotate my shampoos but for color care I really love Fekkai Technician Color Care and Pureology Perfect 4 Platinum. 8. What advice would you give to your younger/teenage self? Brooke: Agreed – so many things! Don’t worry about what people think of you (other than your family and closest friends), stop trying to please everyone, take more time to spend on yourself, live in the moment & enjoy your teenage/early 20’s years – they go SO quickly. Don’t try to “fix” anyone – when people show you who they are believe them, cut out the negative relationships in your life, and travel more! 9. I received a 10% off revolve coupon code because my birthday is coming up. I wanted to see if there was anything you guys had your eyes on for spring/summer or basics that were around $100 I could invest in? Love this boyfriend button down, this denim skirt, these jeans, and this jacket. Great staples you can wear over and over! 10. I’m thinking about planning a surprise weekend trip for my hubby and me in the fall after I’m finished nursing my baby (we don’t get much alone time nowadays lol) and I was wondering if y’all have any places y’all would suggest for a fun, romantic weekend trip! 11. 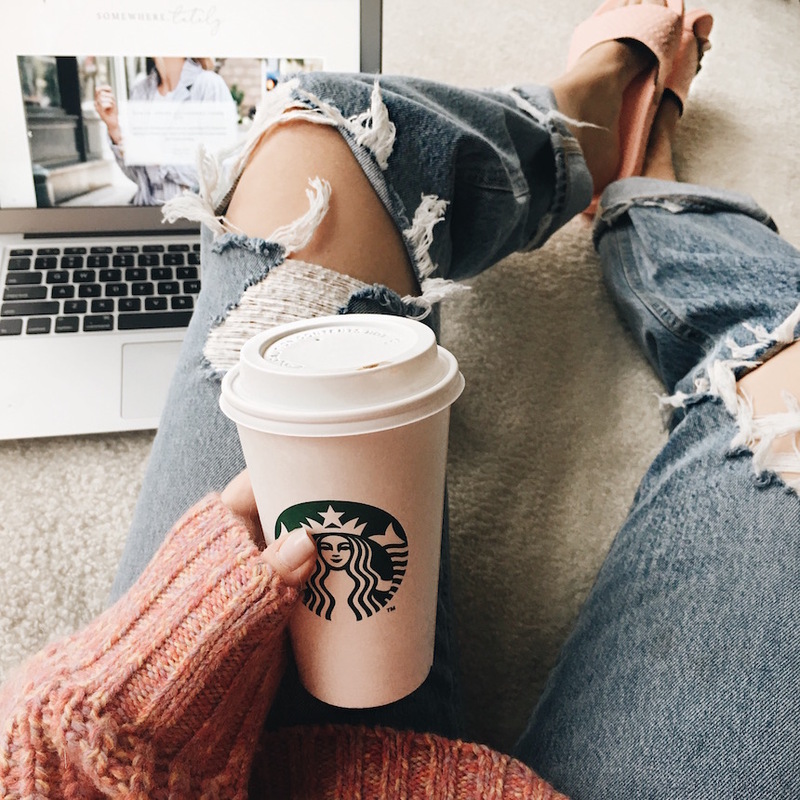 I purchased these jeans during the Shopbop sale and was curious how you would style them? Plain top? Body suit? I don’t want them to be too over the top but love how unique and playful they are. Omg loooove those, my friend has them and she wore the cutest outfit! It was the jeans, these wedges, and an off the shoulder top. Seriously every 5th person was stopping her at the restaurant we were at saying how cute her outfit was. You could also do a plain bodysuit like this one or this one, and wedges (think wedges look best with the hem of these). 12. I’m going to Boca Raton, FL in May and need suggestions on what to pack! Coverups, dinner outfits, etc! Looks so gorgeous there! 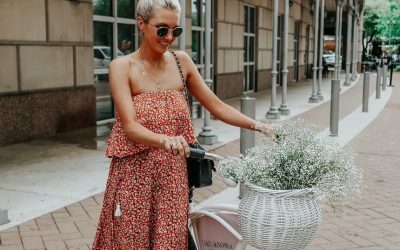 We would pack this coverup, this tote, this off-the-shoulder dress, this set, these sandals, this casual midi dress, these sunglasses, and this romper! 13. One of my closest girlfriends is turning 30 in a few weeks. Any ideas…? She’s about 15 weeks pregnant so was thinking, a prenatal massage…HELP! Love the idea of a prenatal massage! Other ideas we love – this necklace, this blanket (especially for someone pregnant – great gift! ), or some new perfume (pretty, light scent). 14. Do either of you have the Gucci soho disco bag or YSL blogger bag. If so, does it keep its shape? I (Brooke) have the Gucci Soho Disco and it doesn’t really keep it’s shape that well after using it :(. 15. 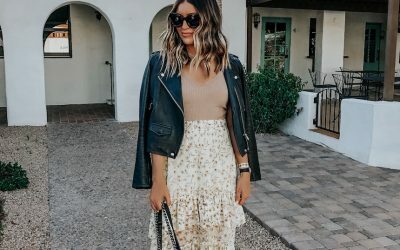 I am attending a rehearsal dinner in June and was hoping you guys could help me find an outfit! It’s for my sister and I’m the MOH. It’s an outdoor dinner and the dress code is dressy casual. I was hoping to find a cute jumpsuit or dress I could wear with flats or wedges since well be on grass. My sister is also looking for bridal options for the rehearsal as well if you wouldn’t mind including both! For you: love this jumpsuit, this maxi dress, this polka dot dress, or this jumpsuit. Some bridal options: this peplum dress, this jumpsuit, this belted dress, and this eyelet dress. 16. I am taking my first trip to Italy at the end of August. I would love some cute travel outfit recommendations for Europe! It will most likely be pretty warm, and we will be doing lots of walking. 17. Looking for a comfy and cute travel outfit? I personally love wearing comfy jumpsuits like this one when I travel (paired with sneakers and a cardigan or jean jacket). Or you can never go wrong with joggers, a band tee, and sneakers or sandals! 18. I’m moving into an adorable apartment in the Wicker Park/Bucktown area of Chicago. I am excited to begin decorating, BUT the bedroom is pretty tiny. Any cute/stylish pieces that are a must to spruce up a small space? Love this wall hanging (would take zero space! but add a lot to the room! ), love these hanging planters – plants add SO much to a space, and this rug is so pretty and a great price! Another great option would be a mirror on the wall to make the room look larger! 19. I’m going to Munich, Germany in early June and all the websites say Germany weather will be in the 70s with night temps in the low 60s. I’m having a hard time trying to find trendy/reusable outfits to piece together for those temps. Any suggestions would be helpful! Pack some good basic pieces that you can mix and match and accessories to dress the outfits up. Definitely pack a couple versatile jackets like a moto jacket and lightweight trench (love this and this), a poncho, basic tees to mix and match, neutral sweaters (like this and this), a couple pairs of your favorite jeans, fun blouses (how cute is this one!?) and sneakers. 20. I work in a hospital but work in a patient care area so I need closed toed shoes. I wear business casual cloths. I would love recommendations for closed toed shoes that would go with a wide variety of work outfits for summer (dresses, dress pants, and leggings). Love these loafers, these (if you want to splurge), these espadrilles, and these flats (great Chanel dupe!). 21. Do you have diaper bag suggestions? Love these Freshly Picked backpacks, this tote looks like it can fit a lot and the black/tan is chic, this one is simple/cute (I had a RM one similar too it and liked it a lot! ), and this one has great reviews! 22. My little sister is 12y old and she’s doing her Solemn Communion in a few weeks and I’m still looking for a dress that is dressy but not office-dressy since I’m 24, wearable at church but not too preppy. After church there is also a party so it would be nice if the dress was ‘casual’ enough to party but also appropriate to wear at church! This dress is gorgeous – not necesarily casual but who cares, lol it’s so pretty! A couple other options that are a bit more casual but still appropriate here, here, and here. 23. I hate washing my hair too 😉 what’s your girls favorite dry shampoos? Meggan: I have so many but always find myself reaching for this Aveda one and this Dove one! Brooke: Love those two as well and this one from R+Co. 24. My boyfriend & I are approaching our one year anniversary, I’m struggling to think of a gift idea!! We live together & I feel like anything he wants he buys for himself! It’s also his birthday 2 weeks later so was thinking to rope it all together. If you have had any awesome gifts in your experience?! We love doing a couples massage at a great spa – such a great experience gift! You could also get tickets to a sporting event or concert if he’s into either of those things! A staycation is another good idea – going to your favorite hotel, out for a fun dinner, and a fun drink spot after dinner! Guys (especially those who buy themselves whatever they want) love experience gifts. 25. Best spring jackets? I’m a mom of four and I have nothing lol! Favorite spring jackets – one (love the details! ), two, three, four, and five! 26. Brooke – Did you move to a new house recently too? I feel silly asking but I don’t think I ever saw for sure! 27. Do you guys have a few outfit ideas for a weekend in Nashville? Also looking for comfortable, on trend sneakers to wear with the outfits as well. This romper is perfect for Nashville, love this mini dress, these shorts, this blouse, this jumpsuit, this tee, and these jeans. We would pack a casual pair of white sneakers like these or these. 28. Brooke, what curling wand and flat iron do you use? Thank you for the hair tutorial yay! 29. I need to get a gift for my mom and sister who are throwing my baby shower in June- any ideas? I probably want to spend about $100 on each. We love anything personalized for a gift – like this bracelet or this necklace (14k gold!). Other gift ideas we would love to get – this robe (everyone needs one! ), a beautiful candle, or a new perfume. Hi ladies! I’ve been invited to a Kentucky derby party next month and could use your help on choosing a dress! I’d like to keep it budget-friendly (no more than $75-$100) and easy to move around in, as I’ll be running around after my 3-year old too. Some shoe options would be great too! The party also falls on Cinco de Mayo, so feel free to throw in any cute dress suggestions that follow that theme too. Thanks so much for your help! I’m in a wedding this summer in Chicago, and the bride is letting us all choose our own dresses. They have to be long and champagne colored…do you girls have any good suggestions? Thank you!! Can you help with gift recommendations for coworkers that “covered my desk” while on maternity leave? Thank you! I’m looking into hiring a weekend sitter. What nanny cam do you use? Do you typically tell sitters up front they will be taped? Have you gotten any weird feed back? What specific questions do you ask them? Thanks! What are your spring must have items? Going to be in Fort Lauderdale, FL next month and my husband and I are going out to dinner for our 5 year wedding anniversary. Any ideas on what to wear? Also, would love your advice on other stuff to pack since we will be there with family for a week 🙂 Thanks! Do you ladies have any good recommendations for healthy/filling snacks that you can easily throw in your bag? Thanks for giving me some good recs for a trip with my hubby! I’ve had Charleston or Arizona in my mind, so I’m thinking one of those maybe. Thanks again!! I am still loving the bucket bag trend for spring/summer! Do you think this will continue to be in style this year? If so, do you have any good picks (designer or budget friendly) ? I love Kate Middleton’s style. Classic and classy! 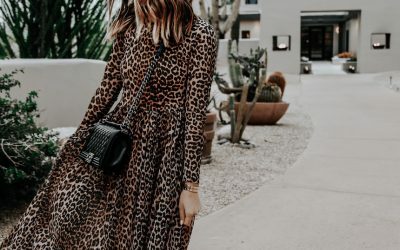 Do you have any outfit suggestions to match this style? 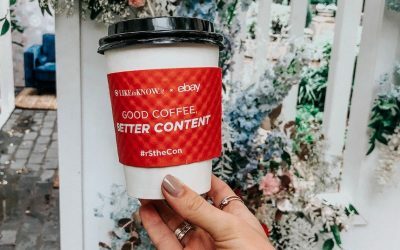 What are your ladies’ Starbucks orders? Question: I’m graduating from grad school in a month but I haven’t found a dress to wear. I’m having a hard time looking for something cute, but balanced between not being too modest or scandalous! Any suggestions? Hello, when we furnished our house a few years back we bought a new king bed in dark cherry, but we did not complete the set. We just planned to buy the dresser and nightstands at a later date but they discontinued the line. Do you have any ideas for mixing and matching with bedroom pieces? It’s been impossible to find a dark cherry that matches perfectly (we’ve bought and returned several pieces). Any help is appreciated! Hello, we will be taking family pictures with my newborn in May, any ideas for shirts that would be good for a postpartum body?